(Eileen Dombrowski, from OUP blog) Today, my dear colleagues, I offer you my final contribution to our Theory of Knowledge course. And then it’s time for me to say farewell. I’m retiring. (by Eileen Dombrowski, from OUP blog) This week, I want to add a couple of ideas, just lightly, to what I said last week. I was presenting an argument back then, feeling the urgency of TOK’s goal to engage critically with the world. In a more mellow mood today, I’m recommending much “softer” class materials, with a gentler touch that leaves educational goals implied. (Eileen Dombrowski, from OUP blog) Remote or engaged? 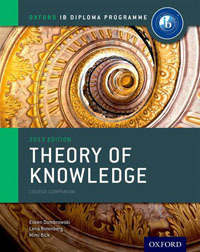 Can Theory of Knowledge have it both ways? In taking a meta-cognitive overview of knowledge, the course may appear to be cerebral and remote. But in teaching skills of thinking critically and evaluating perspectives, it is clearly engaged in life on the ground. How do we manage in TOK to maintain this double vision? Cunning criminality is nothing new. But the “faithful duplicity” of some recent forgeries has stunned art experts and shaken the markets and social organizations that envelop this area of knowledge. Stories of stolen fortunes and international detective work however, can kick-start student interest as we use fake art to raise questions about real art. The TOK questions scream to be asked: What is a “real” work of art if a forgery is indistinguishable? What gives works of art their value? When we start in TOK with a Real Life Situation (RLS) – as our course evaluation puts it – we often get the advantage of the appeal of stories. An excellent article in a recent Guardian Weekly gives us background for narration of modern fakes and provides an account of processes of authentication: The master detective. (Eileen Dombrowski from OUP blog) Could the development in artificial intelligence dubbed “deepfakes” really “trigger social unrest, political controversy, international tensions” and “even lead to war”? Have our previous methods of telling fact from fiction been irremediably undermined? As teachers, we’re careening down new paths in evaluation of knowledge claims, trying to learn to steer in time to teach our students to drive!